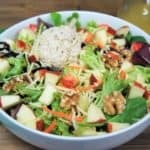 Forget boring salads, this tuna apple white cheddar salad is loaded with delicious and filling ingredients. This salad starts with a generous bed of lettuce, then we add a heaping serving of a light, yet creamy tuna salad. For some crunch, there’s walnuts and shredded carrots. White cheddar cheese adds even more flavor and a creamy touch. 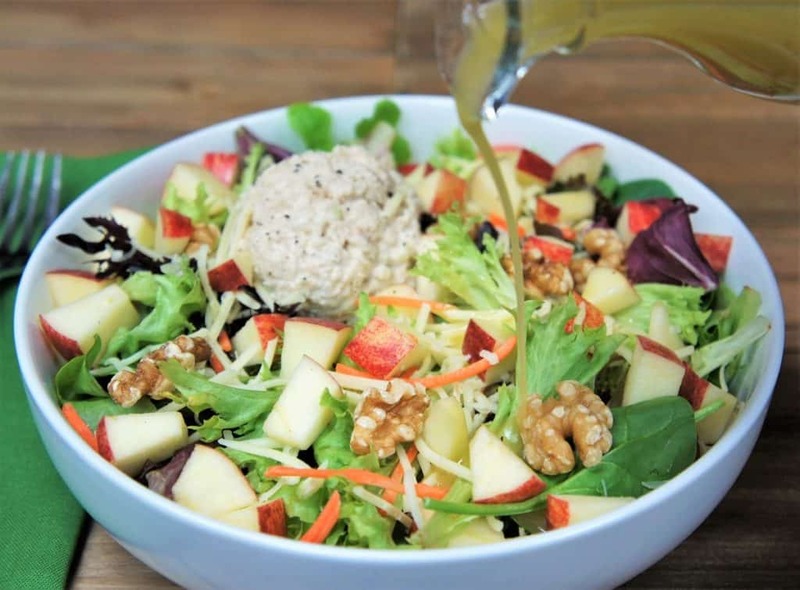 Top it all off with a homemade apple cider vinaigrette and you’ll have a salad you will look forward to eating. Add all the dressing ingredients to a jar, or a container with a tight fitting lid. Cover the jar and shake vigorously to mix. Refrigerate until ready to use, stir vigorously before each use too. Divide all the salad ingredients into four portions. Add the lettuce to 4 individual bowls. 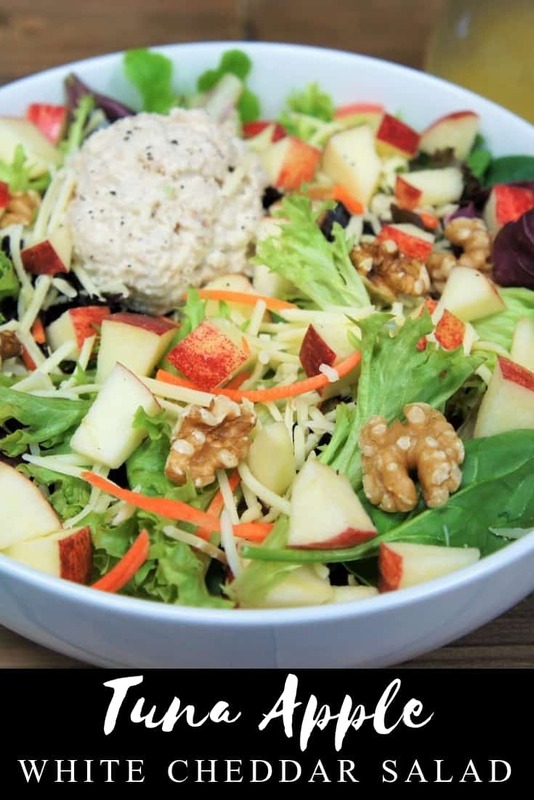 Top with a scoop of the prepared tuna salad, apples, cheese, walnuts and shredded carrots. 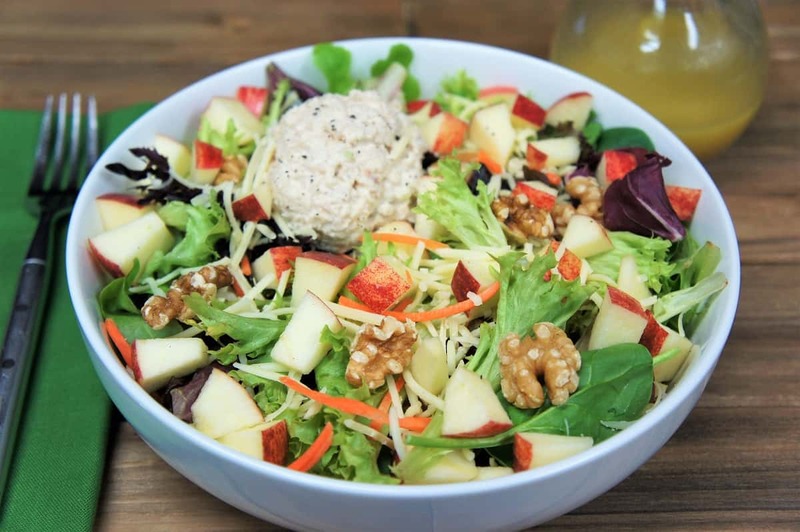 Serve the tuna apple & white cheddar salad with the homemade apple cider vinaigrette and enjoy! The secret to perfect tuna salad is to break up the pieces of tuna really well. Stir the tuna with a fork, pressing down and breaking up any chunks. Do this, basically, until your hand hurts. Then take a break, and keep stirring and breaking up the tuna. If you’re using pouch tuna there is no need to drain. If you’re using canned tuna, drain it, but don’t leave it bone-dry. Taste the tuna salad and add more salt and pepper only if needed. Cover the bowl and refrigerate until the tuna salad is cold. Divide all the salad ingredients into four portions. Add the lettuce to 4 individual bowls. Top with a scoop of the prepared tuna salad, apples, cheese, walnuts and shredded carrots. The secret to perfect tuna salad is to break up the pieces of tuna really well. Stir the tuna with a fork, pressing down and breaking up any chunks. Dice the onions and the celery as finely as possible. The trick is, to have a subtle flavor and just a little bit of crunch. This Asian chopped salad is a crisp, fresh and filling. It’s great for lunch or a light dinner. Green and red cabbage are combined with romaine lettuce, carrots and green onions. 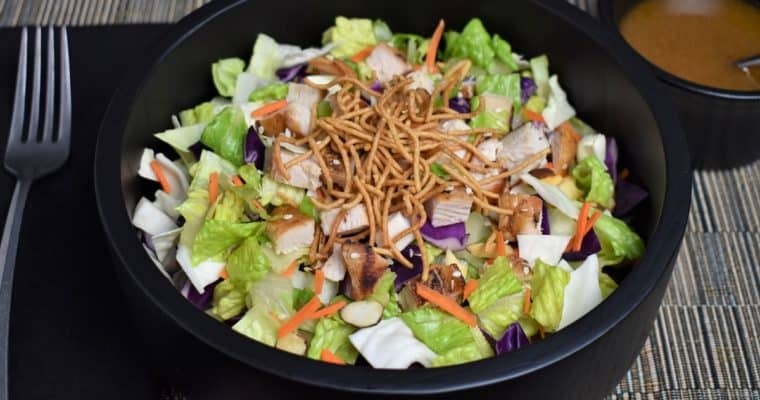 Then the salad is topped with grilled chicken, toasted almonds, rice noodles and sesame seeds.